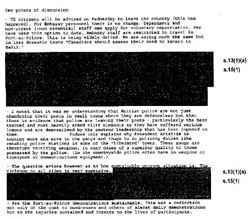 Documents provided by the government under the Access to Information act were heavily censored, and 25 days-worth of documents were omitted without explanation. View all the documents acquired by the Dominion. Classified memos obtained by The Dominion through an Access to Information Act request raise new questions about the extent of Canadian participation in the 2004 coup against Haiti's democratically elected President Jean Bertrand Aristide. Nine days before the February 29 coup that removed Aristide and thousands of elected officials, then-minister Denis Coderre told the Canadian Press that "it is clear that we don't want Aristide's head; we believe that Aristide should stay." In the same report, then-Foreign Affairs Minister Bill Graham claimed that Canada was seeking to pressure Aristide to adopt a series of measures to give the opposition more power in government. Nine days earlier, on February 11th, Canadian Ambassador Kenneth Cook sent a memo marked "Confidential" to the Privy Council Office and Department of Foreign Affairs and International Trade, with a subject heading "Meeting with US Ambassador." Its contents suggest that Canada was planning for the removal of the Aristide-led government while officials publicly claimed to be attempting to reach a peaceful agreement. The situation we face is not only one of a struggle for power, it involves a humanitarian crisis and the potential to permanently change the course of Haitian history. President Aristide is clearly a serious aggravating factor in the current crisis and unless he gives dramatic early signs that he is implementing the CARICOM road map then the OAS, CARICOM and possibly UN will have to consider the options including whether a case can be made for the duty to protect. Large portions of the memo, which discusses specific plans for military intervention, are blacked out. Of the period requested, February 5 to March 15 2004, Feb 20 to March 15 were omitted without explanation. The "duty to protect" is another term for the controversial Canadian-sponsored "responsibility to protect" (R2P) doctrine, which was adopted as international doctrine without a vote by the UN General Assembly at the UN World Summit in September 2005. Countries like Cuba and Venezuela have strongly opposed the doctrine, saying that it gives powerful countries freedom to intervene when they determine a state to have "failed." Notable Canadians involved in the drafting of the R2P doctrine were Michael Ignatieff and Lloyd Axworthy. In his writings, academic-turned-politician Ignatieff has praised the US as an "Empire Lite," and supported the US-led war on Iraq. Axworthy was Canada's foreign affairs Minister in 2000 when economic sanctions were levied against Haiti's democratically elected government. The R2P doctrine developed a framework for "threshold criteria for military intervention," under the guise of "humanitarian intervention for human protection." Under the core principles devised in this doctrine, "the principle of non-intervention yields to the international responsibility to protect." Two "precautionary principles" of R2P stand out. First, that "the primary purpose of the intervention...must be to halt or avert human suffering," and second, that military intervention must only be used as a last resort, "Military intervention can only be justified when every non-military option...has been explored." In this case, substantial evidence suggests that the crisis that Ambassador Cook used to invoke the R2P was itself instigated by the US State Department and other US and Canadian agencies. The US, Canadian, and European Union-funded "civil society organizations" though lacking in popular support, continually demanded that Aristide step down and that their representatives be granted key positions in government. US, Canadian and French diplomats insisted on opposition support for any power-sharing agreement. Some critics claim that the three governments knew that the opposition would not accept any agreement other than one that gave them control. According to many reports, the intervention itself, justified in memos by the R2P doctrine, had the effect of multiplying and aggravating the humanitarian crisis. An April 2004 human rights report prepared by the National Lawyers Guild (NLG) found that "the multinational force of 3,600 soldiers... was not functioning to protect supporters of President Aristide or prevent killings, kidnappings, and arsons directed at this supporters." The NLG met with the Director of the State Morgue in Port au Prince, and reported that "The Director admitted that 800 bodies were 'dumped and buried' by morgue on Sunday, March 7, 2004, and another 200 bodies dumped on Sunday, March 28, 2004. The 'usual' amount dumped is less than 100 per month." A March 2005 Harvard University Law School report, "Keeping the Peace in Haiti?" contended that the UN military force, MINUSTAH, "has effectively provided cover for the police to wage a campaign of terror in Port au Prince's slums." Having discovered evidence of a mass grave, the human rights delegation found MINUSTAH officials aware but unwilling to investigate the "clandestine gravesite." Canadian UN police (UNPOL) Commissioner David Beer, while ackowledging that grave sites were "a point of contention," said that the grave "was not an active case being investigated." According to other government documents acquired by The Dominion , Denis Paradis organized a January 2003 meeting "in the spirit of the responsibility to protect." The secret, high level roundtable was dubbed the "Ottawa Initiative on Haiti." Details of this meeting were leaked in a March 15, 2003 edition of l'Actualité , by reporter Michel Vastel. Vastel wrote then that the theme "Aristide must go," along with the possibility of a "Kosovo-model" trusteeship over Haiti, were discussed by members of the Canadian, French, and US governments, along with representatives from the Organization of American States (OAS). In an effort to control the damage of the media leak, the Canadian government issued a release denying that regime change or a trusteeship were discussed at this meeting.